By Ooi Kee Beng, for The Edge Malaysia, 27 October 2014. South of China, east of India and north of Australia, much is about to happen. This is besides the endless outbreaks of diplomatic antipathy and maritime scuffles between claimant states in the South China Sea, all poignantly signifying Beijing’s inevitably enhanced role in East Asia. Alongside that, Japan is feeling great unease, see its economic predominance in the same region is being challenged more thoroughly than it has been for many decades. What gets overshadowed are key developments taking place on land in the region lying between China, India and Australia. The chief of this is of course the ASEAN Community that is to come into being by the end of 2015. What this signifies is the coming of age of the region. This maturing of regional collaboration also marks a new phase in the development—and identity—of the countries and the peoples found there. To see this more clearly, let me first place Southeast Asia in the flow of history. The region has for hundreds of years had a relatively peaceful existence, partly because of its archipelagic nature and partly because it has laid outside the main theatres of world events. In a word, the region was peripheral to the main flows of history, whether Asian or global. Inevitably, Southeast Asia was a thoroughfare for goods, people and religions. The region was certainly a supplier of all sorts of exotic goods, like spices for Europe and birds’ nest for China, before it developed into an archipelago of plantations and mines in the later European colonial period. The Chinese used to call the region Nanhai, and the Japanese likewise referred to it as Nanyo. From the west, names like Further India was used. The northern part was strikingly called Indo-China by the French. The southern part of the region was simply the Indian Archipelago, i. e. Indonesia. 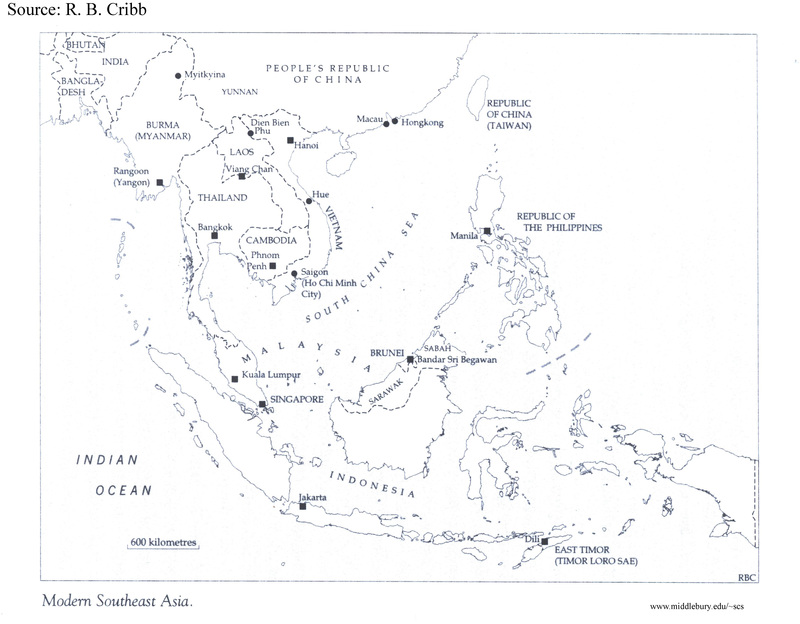 Any which way you look at it, Southeast Asia is a territory of coastlines, islands, ports, river mouths and harbours. It is exasperatingly maritime, and it lay not only beyond, but also between great civilizations. In fact, “Southeast Asia” as a concept and a unit of analysis is a recent creation coined for strategic reasons during the Second World War. As the British and the French retreated westwards away from the advancing Japanese, Southeast Asia became a front for limiting the war. The Americans were concerned about East Asia than its southern periphery, perhaps until today. But even during the Second World War, for the British, other battlegrounds were more important, as was also the case for Japan, whose major battles were fought in China, and in the Pacific against the Americans. And during the Cold War, Southeast Asia was a buffer zone between Left and Right. Such is the global context within which History placed Southeast Asia. We can also cut up the regional cake into a Buddhist, a Muslim and a Catholic piece, or the continent from the maritime. And then we have the colonial dissections performed by the Spanish, Portuguese, Dutch, British, French, and Americans. The legacy of being peripheral to world history is Diversity—in ethnicity, in history, in culture and in religion. Outflows from China configured the north of the region, outflows from India and from Arabia affected the south, and European influences washed over both. This is the historical preamble for understanding the present and future significance of regionalism in Southeast Asia, as expressed through the Association of Southeast Asian Nations (ASEAN). Unlike Europe, there is no cultural imperative to integrate in this region, only the strategic need to be, for once, an actor in its own future. It is in this context that ASEAN must be understood. Started by insecure countries that were beginning to realise that they were not masters of their own fate, regionalism in Southeast Asia began as a forum for its peoples to dialogue with their neighbours. With the end of the Cold War and the rise of economic giants in the neighbourhood, ASEAN went from maintaining regional security to fostering economic regionalism. More than that, a historical role is now thrust upon it to function as a forum for big power dialogue, allowing it to punch above its weight and facilitate peaceful co-existence in the greater region. In essence, the region’s struggle is to be—and to be seen to be—as pro-active and progressive a power as possible, and a significant economic market and producer to boot. ASEAN centrality is a new phase in the region’s history in that it allows the region’s peoples and governments a greater say in their own fate. This function is often forgotten even by actors in the region, which is that the Southeast Asian role in most of modern history had been a passive and reactive one. In many ways, little Singapore can be used to reflect the strategic mind-set that ASEAN is developing. Singapore is a small country among many big countries; ASEAN is a small player among many big players. The survival of both depends on strategic skill. Thus, making oneself useful to bigger players in ways that will not badly compromise one’s integrity becomes the ASEAN Way. For each member to make its national interests overlap with regional interests is necessary if ASEAN is to retain its centrality. Otherwise, the region runs a real risk of becoming peripheral again.